Kyosai‘s series ‘Hana-goyomi (Flower Calendar) is a delightful set of twelve koban (small-format) prints serving, as the title suggests, as a monthly calendar. 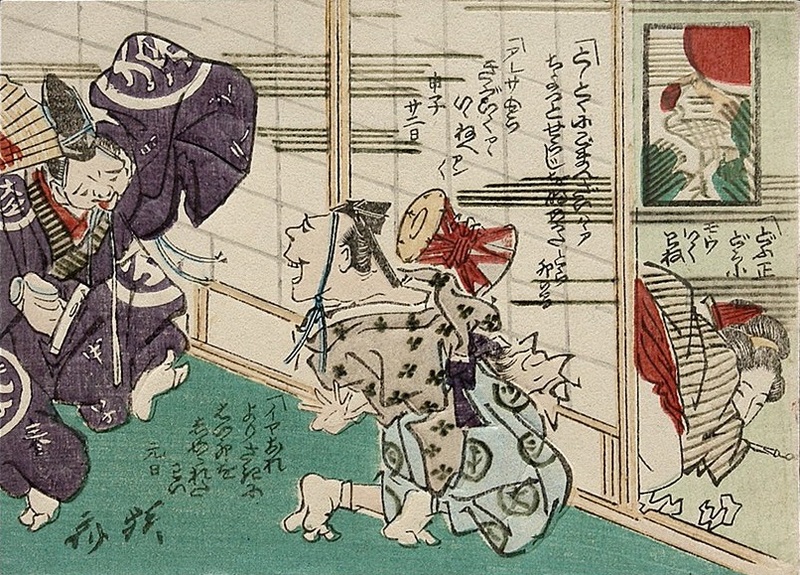 During the Edo period the year was divided into twelve lunar months, some having thirty days (dai or long months) and others having twenty-nine days (sho or short months). The length of a given month changed from one year to the next. Every few years it was also necessary to add a thirteenth intercalary month, to maintain the timing of the seasons. The public learned the schedule for the upcoming year from printed dai-sho calendars. On each print in this set, the name of the month is incorporated into the printed dialogue and indicated as well in the hanafuda playing card at the top. A lunisolar month corresponds to a month in the solar calendar that is numerically one higher. For example according to the lunisolar calendar plum blossoms flower around New Year’s, whereas according to the solar calendar they flower around early February. ‘A woman fooling around with a manzai performer who has come to the house to celebrate the New Year and perform a dance.’ First month. Date: 1864. Click HERE for the design of the second month!